The Rad Fondo Six Pack Challenge is a series of rides starting in San Clemente, one per month from October to March. 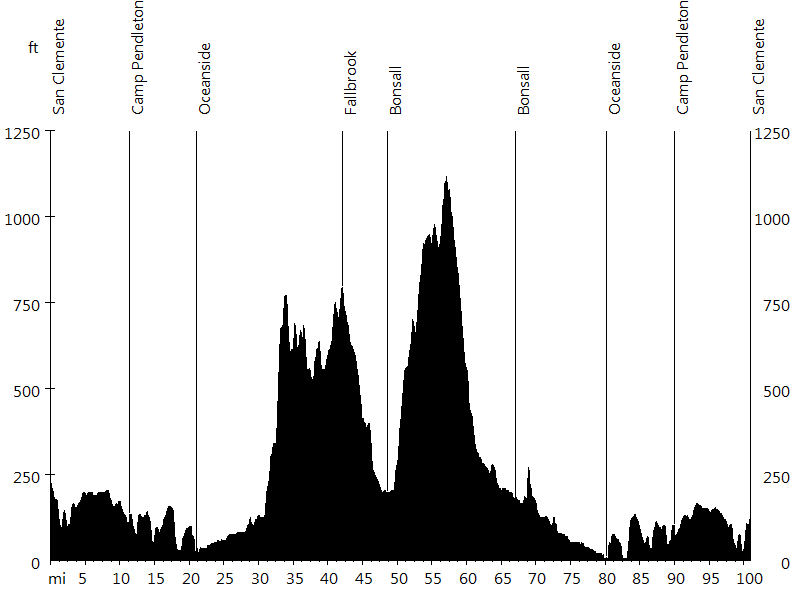 A Rad Fondo is a 100-mile ride that is ridden as a group at winter training pace. There is a three flat rule, meaning the group will stop for the first three flat tires, then everybody is on their own. The event is free and includes two supported stops as well as a post-ride meal. 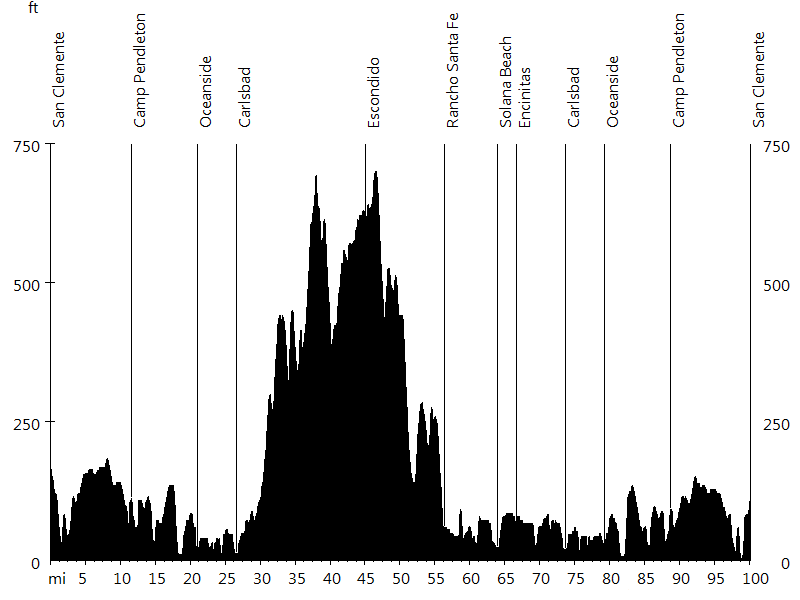 Ride 1 starts in San Clemente and leads north through the canyons, back to the coast on Santa Ana River Trail, and back to the start along the coast. 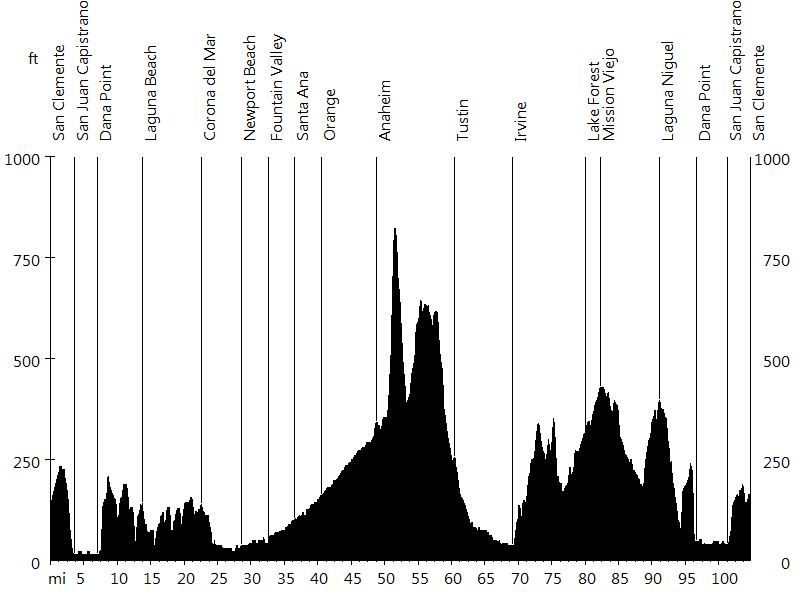 The ride follows Antonio Parkway and passes through Trabuco Canyon, Live Oak Canyon, and Santiago Canyon. It then climbs Cannon Street which turns into Imperial Highway. Santa Ana River Trail continues towards Newport Beach, and Pacific Coast Highway leads south through the beach cities and back to San Clemente. Ride 2 starts in San Clemente and leads south to Oceanside and inland, where it follows a figure eight loop before it returns. On the way to Oceanside the ride passes through Camp Pendleton Marine Corps Base. Then it continues on San Luis Rey River Trail to College Boulevard. North River Road leads to Sleeping Indian Road, which climbs towards Fallbrook. Green Canyon Road leads to South Mission Road, which descends into Bonsall. The ride then follows West Lilac Road. Circle R Drive, Old Highway 395, and Camino Del Rey lead back to Bonsall, and Old River Road leads back to North River Road. From here on back to San Clemente the route is the same as at the beginning. 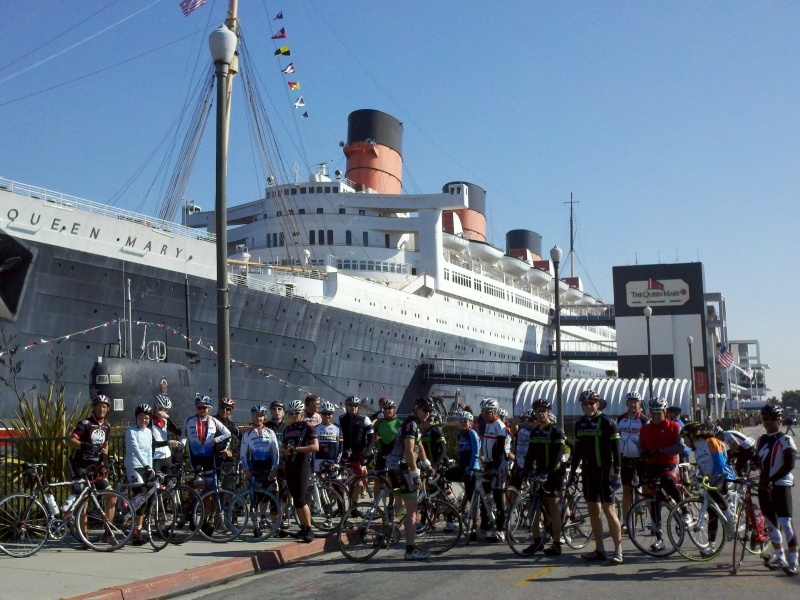 Ride 3 starts in San Clemente and leads to the Queen Mary in Long Beach and back, climbing Newport Coast on the way north. 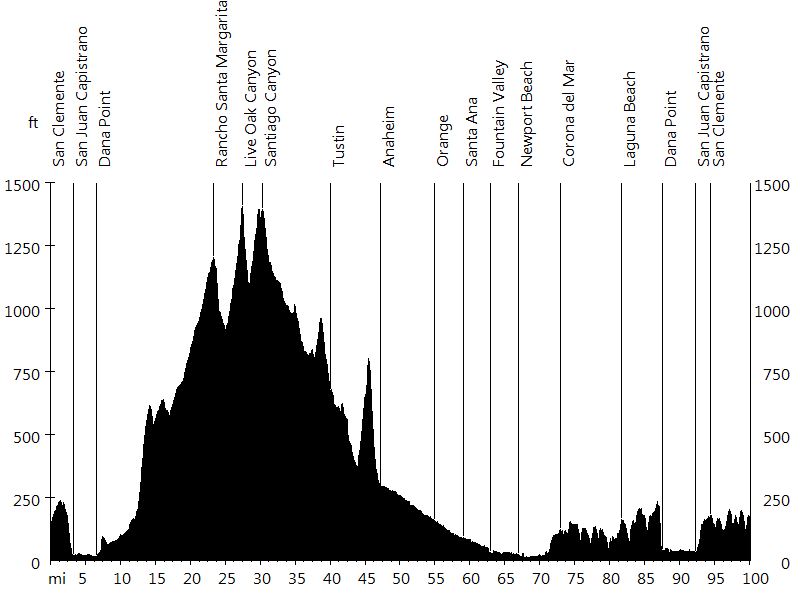 The ride follows Pacific Coast Highway for the most part. To make the distance 100 miles, it climbs Newport Coast Drive and Vista Ridge Road, offering views of Catalina Island in the west and the mountain ranges in the east. San Joaquin Hills Road leads back down to PCH. After crossing the San Gabriel River, the ride passes through Naples Island and Belmont Shore. Ocean Boulevard and Shoreline Drive lead to the Queen Mary. 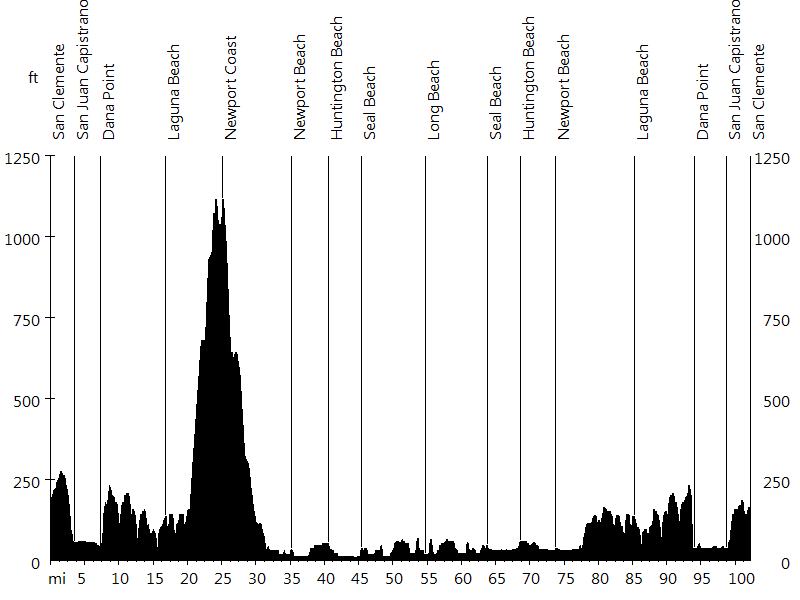 The way back follows the same route, except for Newport Coast. 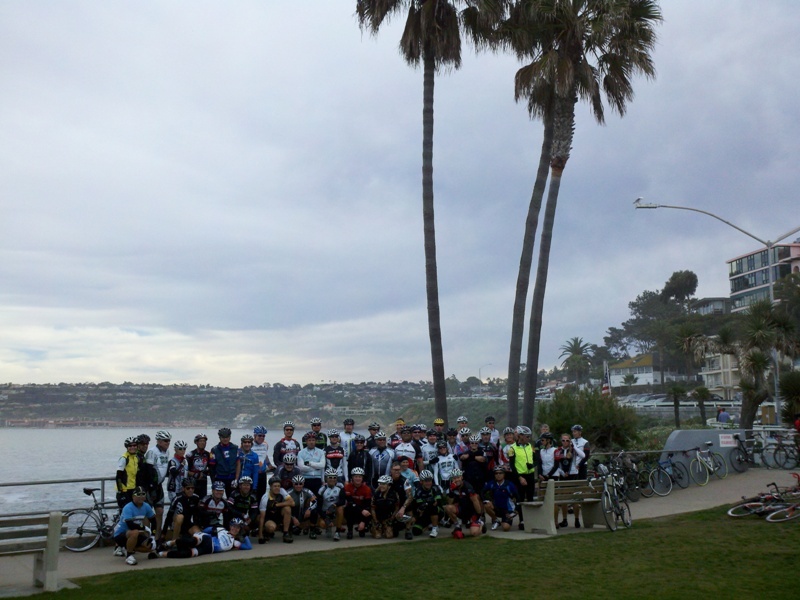 Ride 4 starts in San Clemente and leads south to La Jolla and back. On the way to Oceanside the ride passes through Camp Pendleton Marine Corps Base. Then it continues on Pacific Coast Highway, visiting the beach cities and climbing Torrey Pines. North Torrey Pines Road, La Jolla Shores Drive, Torrey Pines Road, and Prospect Place lead down to La Jolla Cove, where sea lions and harbor seals can be found. The way back follows the same route. Ride 5 starts in San Clemente and leads north along the coast, inland on Santa Ana River Trail, and back to the start on various roads and trails. 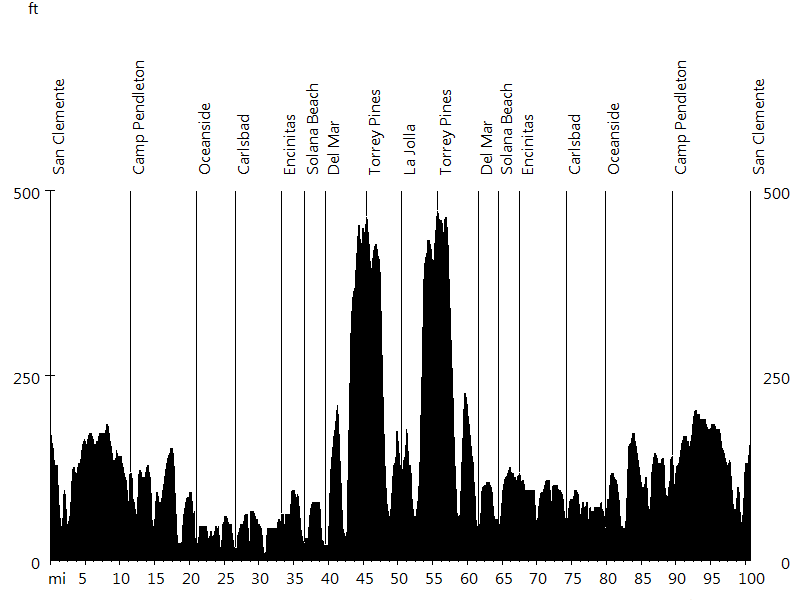 For the first half, the ride follows Pacific Coast Highway and Santa Ana River Trail. It then climbs Imperial Highway which turns into Cannon Street. Santiago Canyon Road, Jamboree Road, Portola Parkway, Peters Canyon Trail, Harvard Avenue, and San Diego Creek Trail continue to the University of California, Irvine. After passing through the campus, the route follows Shady Canyon Trail. Alton Parkway, Muirlands Boulevard, Los Alisos Boulevard, Paseo de Valencia, and Laguna Hills Drive lead to Aliso Creek Trail. Crown Valley Parkway and Camino del Avion continue to Salt Creek Trail, which offers stunning views. PCH finally leads back to San Clemente. Ride 6 starts in San Clemente and leads south to Carlsbad, where it follows a loop through Elfin Forest Recreational Reserve, which returns to the coast at Del Mar Horse Race Track. On the way to Oceanside the ride passes through Camp Pendleton Marine Corps Base. Then it continues on Pacific Coast Highway until Carlsbad, where it turns inland on Palomar Airport Road. Melrose Drive, San Elijo Road, Elfin Forest Road, and Harmony Grove Road lead to the outskirts of Escondido. County Highway S6 continues back to the coast, passing Lake Hodges and visiting Rancho Santa Fe. Pacific Coast Highway leads through Solana Beach, Encinitas, and Carlsbad, from where the route is the same as at the beginning. The rides are rad. They are a good opportunity for newer riders to work on their group riding skills, and for everybody to build up their endurance. Stronger riders can take more pulls in the front, while others might prefer to sit in. Many riders only join the group for a portion of the ride. Thanks a lot to Mike M. for organizing the rides, and to Leah and Hannah for supporting them.